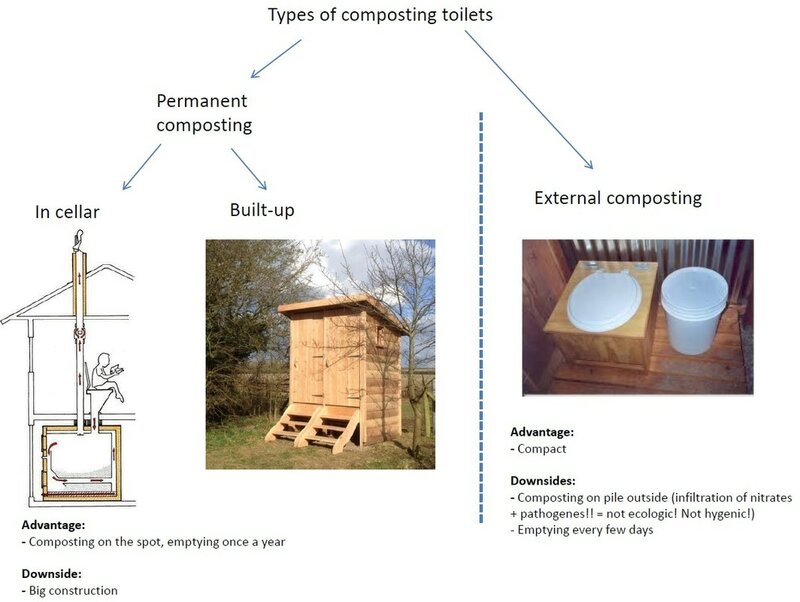 A composting toilet is a toilet that uses no or less water and composts humanure (and urine) in stead of slushing it down the drain. At Hamadryad we eventually decided to use a flushing toilet with an individual natural purification system and recuperation of purified water. This tackles the first two of the main advantages and has no disadvantages. As Hamadryad will be rented to tourists there is no use for a closed circle system (as there will be no vegetable garden on site and so no need for extra composting from humanure). 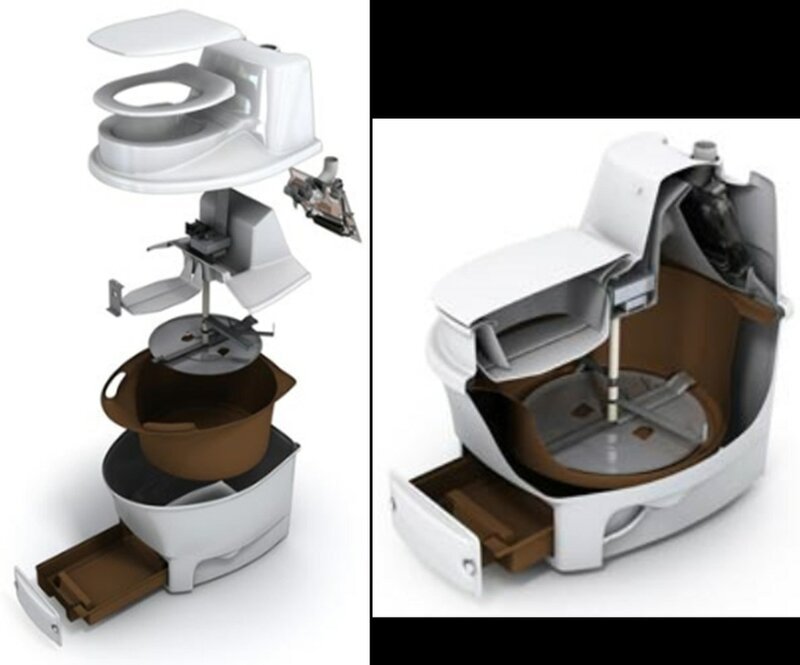 If you want a hygenic composting toilet inside the house and don't want to connect to a sewage system to get rid of the urine, there are systems with integrated mixers, fans and heaters. One example is the Biolit, which (only) consumes 65 Watt/hour. Worth considering. 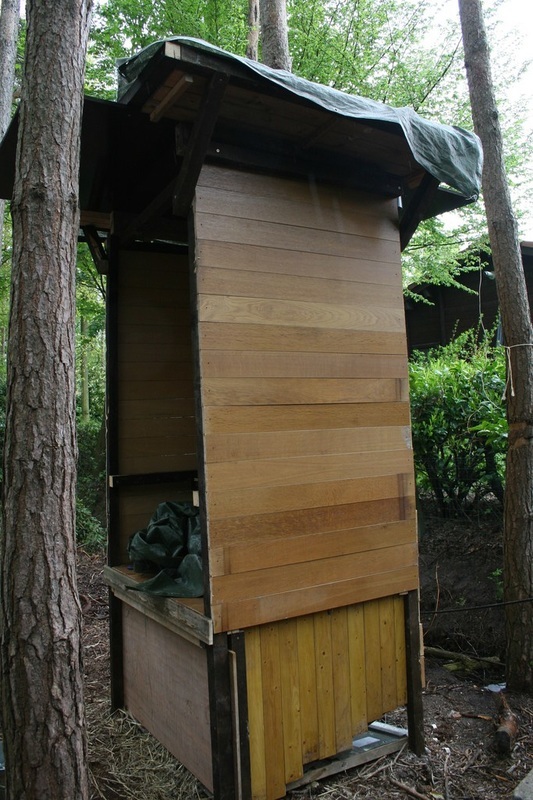 We built a temporary composting toilet to use during the construction of the house. It was a 1-day project, so nothing fancy, just functional. All wood we recovered from a broken down chalet in the forest. After 6 years nature has struck back and the composting toilet is slowly detoriating. 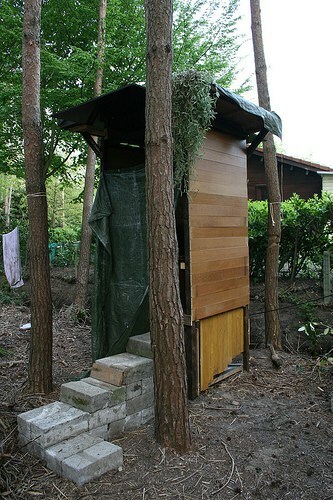 ​We decided to build a permanent mixing composting toilet outside. 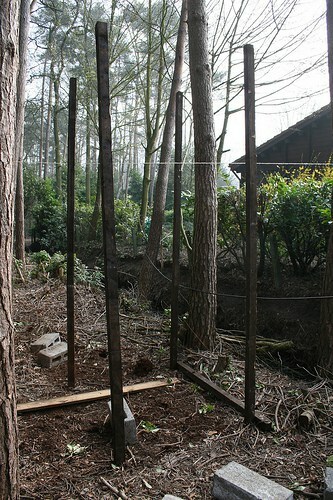 First we put four vertical rafters in the ground. Since the composting toilet was a temporary one, we took our chances not to have a foundation. In case you would build a permanent toilet you could use a rubble trench foundation and some big stones underneath each pole to have a more durable solution. 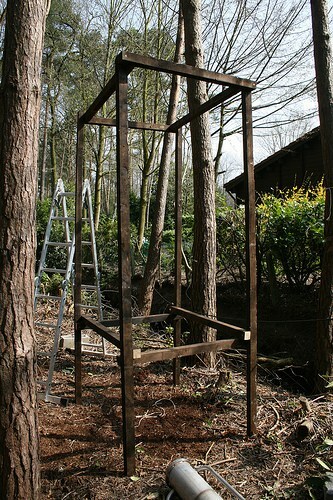 Next we connected the vertical rafters with some horizontal ones to make the base structure. At the lower section we added a sloped platform. Between the planks we left about a cm of space. This will provide sufficient venting. We also added another vertical beam right next to the existing one at the front (right on the picture) side of the structure. Between the two vertical rafters we added a board that can slide out to empty the toilet when it's fully filled up (after about a year of use). The roof is a simple square construction with a bottom of boards. The roof overhang is supported by diagonal rafters. 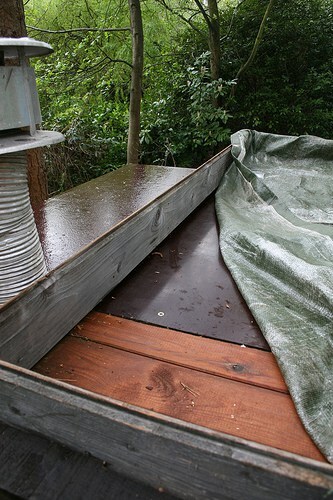 The roof was covered with an old tarp. I doubted it would hold for long, but even after 6 years there is no water seaping through! 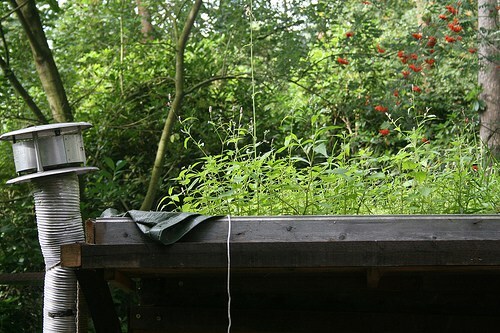 We filled the square roof with forest ground and after a few months plants and flowers started to grow on it. A small green roof! 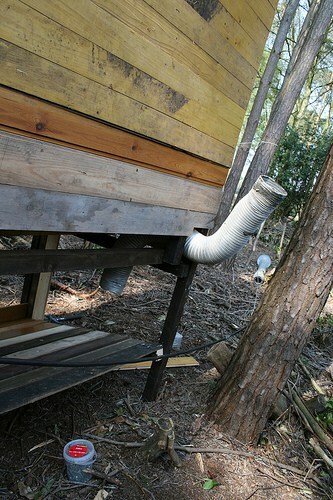 Also note the venting pipe at the back of the composting toilet. It is connected to the lower section to get more venting in that area. To be honest... I think it's a little bit overkill for an outside composting toilet. 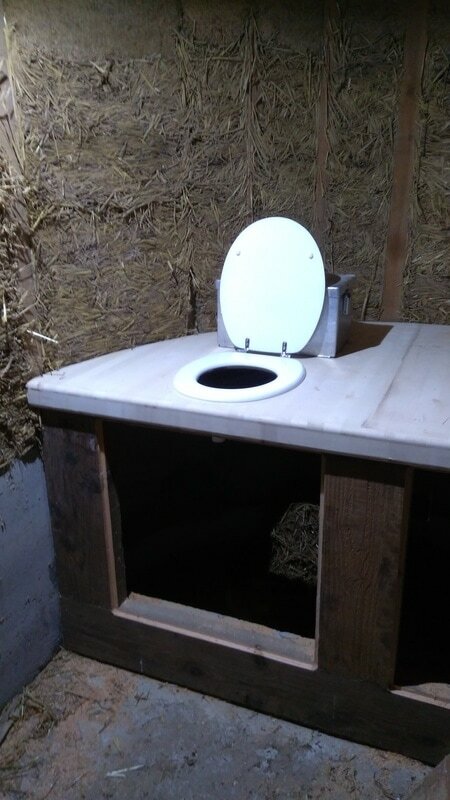 If you are building an inside composting toilet, it is strongly advised to have a good venting in the bottom area. 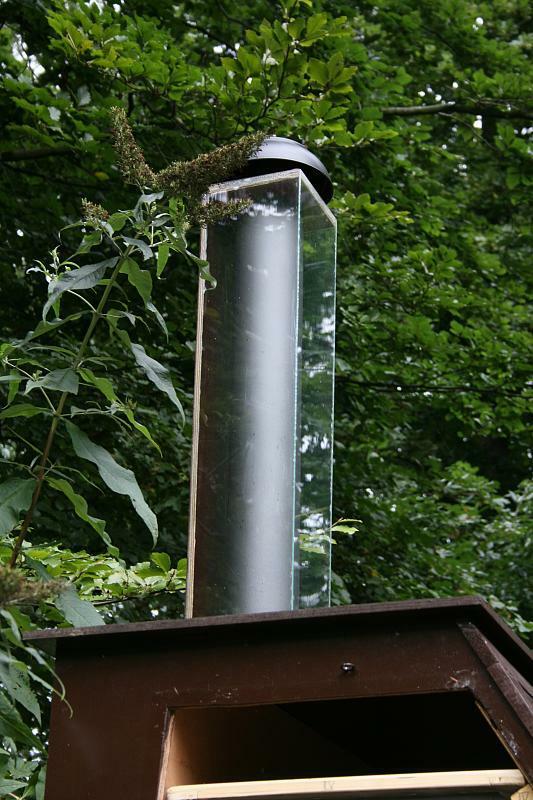 To get an even better venting you can surround the venting tube with a small green house... this will heat the pipe and give a better air draft. We recovered some concrete bricks and used them to build a temporary staircase. 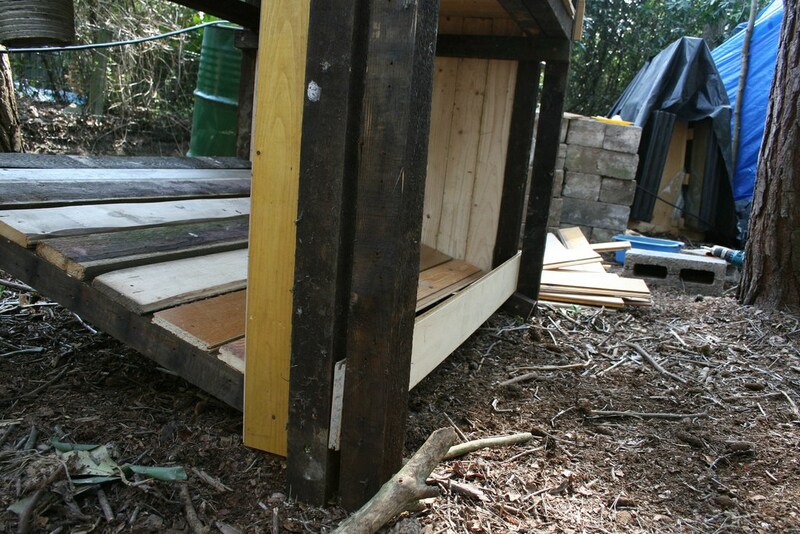 Below the composting toilet we added a slightly sloped metal plate (should be PP to prevent smells!!) and a plastic (PP) tube. If there was any urine seaping through the composting pile it would finally land on the metal plate and drained away by the plastic tube. The tube should lead to a purification system (sand filter, cocofilter, etc.) because the urine is infected with pathogenes (when it perculated through the humanure) and has a high nitrate content. As we had no urine seaping through during the eight years of use, there was no reason to install a purification system. 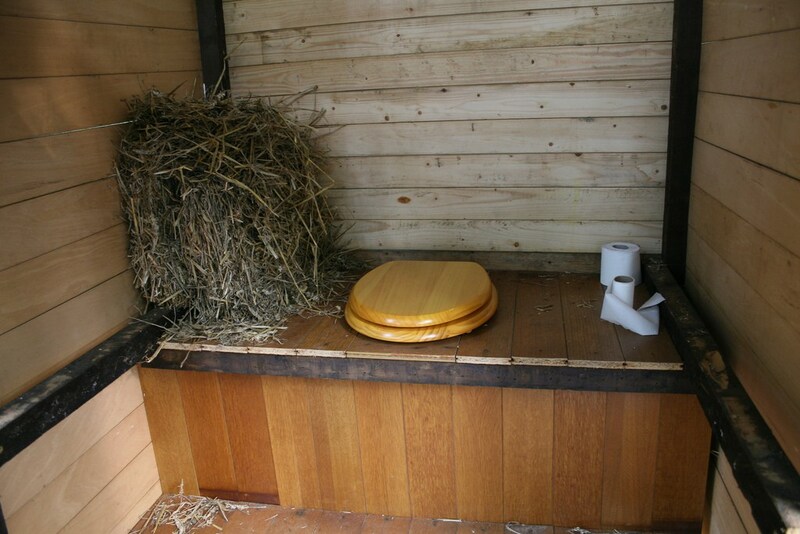 Our composting toilet had good venting system and we added a lot of natural absorbing materials after each use which worked as an organic spunch, sucking up all the urine. Allthough the construction was very basic it was pretty comfortable and functioned splendid! We have no bad smells at all! We built a permanent composting toilet inside the house. When it was almost finished we concluded we needed to separate urine from humanure to prevent having a heater and/or fans to evaporate the excess of urine (as it is inside and less natural draft is available) . Separating urine means we needed to purify that urine or use it in the garden. Using urine in the garden, needs diluting it by 8/1 and that would use almost as much water as a regular flushing toilet! The main key to prevent smells is to have a good way of composting urine and humanure. We solved venting by having the slated planks at the bottom (with 1 cm of spacing between every plank) and by having the venting tube at the back of the toilet. We placed the back of the toilet to the south side so it would get heat from the sun all day. You can also use a glass panel at the back to gain even more heat. At first we separated urine and humanure. But soon we got some bad smell once in a while. We found out that the composting process wasn't working out as it should be. We also noticed the pile was very dry. So we tried a different approach: mix urine and humanure (no separation). As soon as we got this going, the smells dissapeared completely. ​When urine is absorbed by a material it leaves a very distinctive smell that is VERY hard (often impossible) to get rid off. This is why you need to prevent any contact between absorbing materials (wood, metal, most plastics, etc.) and urine. 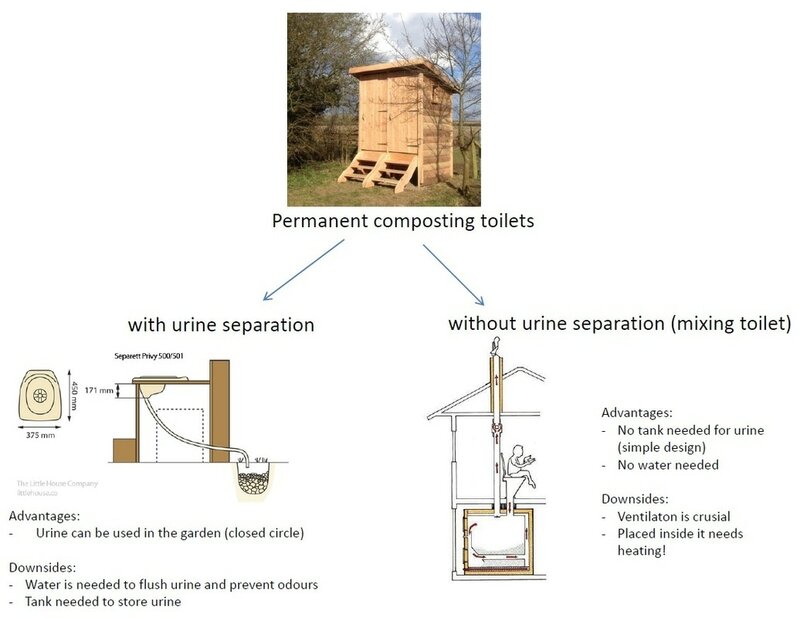 ​This can be done by having some parts of the composting toilet lined with a non urine absorbant material. Especially when men sit down they tend to urinate forward, hitting the wood behind their legs. After every visit at the composting toilet you need to add 'brown material' to the pile. Although we talk about 'brown material' it doesn't necessarily need to have a brown colour. It often does, though... Brown material is material that generally has a high amount of carbon (twigs, brown leafs, straw, sawdust, etc.) while urine and humanure are in fact considered to be 'green materials' due to their high leverl of Nitrates (other examples are green leafs, needles, etc). In a composting pile the carbon-nitrate balans needs to be about 25 to 1 !!! So to keep the pile in balans a lot of brown material needs to be added. Straw was a disaster... it absorps a lot of urine and starts smelling pretty quick, it's also a hard material to compost. Sawdust works better, but the best result we got with the top soil of our forest ground. It's logic: It contains a huge amount of carbons, its humid and there is plenty of life inside (bacteria, fugi, etc) which help the composting process. We believe the amount and type of material added after each visit is the most important factor to prevent smells. So experiment with this when you do have smells!! As you can see even green material has a much fewer amount of nitrates than carbon, but as we need a balans of 1/25, all materials with a higher ratio (eg. 1/20) are considered to be 'green' and the ones with a lower ration (eg. 1/90) are considered to be 'brown'. You also notice sawdust has a better ratio than fallen leaves, but as mentioned before fallen leaves detoriate quicker and to us seemed to have a better result.